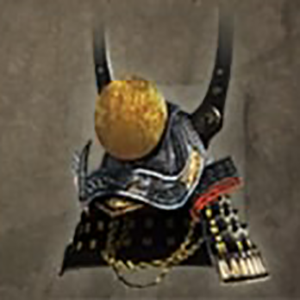 Golden Sun Kabuto is a Head Armor in Nioh. "The beloved helm of Goto Mototsugu, commonly known as "Matabe," who served as a retainer to Kuroda Kanbei and his son Nagamasa. After a disagreement with Nagamasa, Matabe fled his post and was ultimately banished from the family, preventing him from ever serving another household. He then spent time in Kyoto as a ronin, or masterless samurai, before serving at Osaka Castle. The front crest bears a blazing golden sun that represents Marishiten, a Buddhist deity that governs the sun and moon. Generations earlier, Kusunoki Masashige and others worshiped Marishiten, and so too did later warlords, such as Date Masamune and Tachibana Muneshige, who decorated their helms with emblems of suns and crescent moons. Marishiten is said to reveal herself as shimmering heat and cover the earth so as to be undetectable by enemies and therefore"